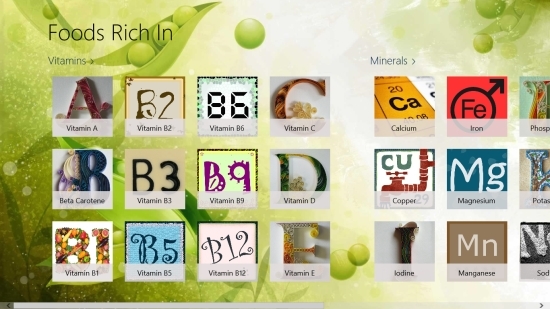 Foods Rich In is a free Windows 8 Food app that tells you about various essential nutrients and their sources. It is basically an informative app that brings to you the very basic and extremely important information about food nutrients such as Vitamins, Minerals, Carbohydrates, and more. The app is a handy nutrition guide that displays the relevant information in a beautiful way. The app is very useful, especially if you have developed deficiencies of certain nutrients or you’re following a specific diet plan. The app describes the importance of each of the essential nutrients, their suggested Daily Value (DV) in diet, effect of their over-consumption and under-consumption on our body, and various vegetarian and non-vegetarian foods that contain these essential nutrients. Foods Rich In is freely available in Health & Fitness category of Windows Store. You can also view the app directly in Windows Store by clicking on the link given below at the end. Let’s have a detailed look at this free Windows 8 Food app. 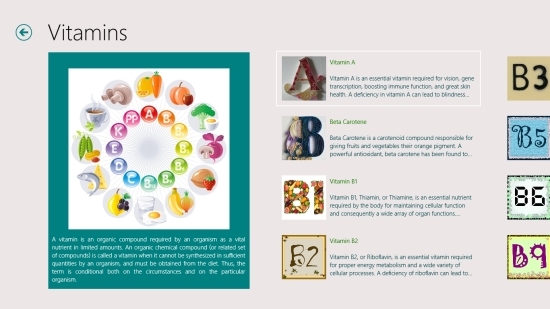 The important information about various nutrients is put together very beautifully in the app. The interface looks designer with colourful nice pictures and letters. And it is very convenient to access information provided in the app too. As you launch the app, the Start screen will display various categories of nutrients including Vitamins, Minerals, other Nutrients such as Carbohydrates, Fibre, Sugar, and Protein. The tiled interface displays various nutrients under each category that looks really awesome. Click on a category to open the list of nutrients it covers. 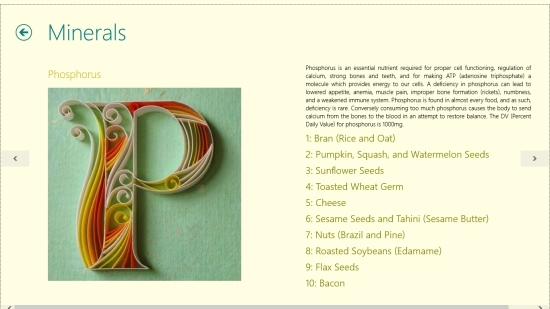 A brief description about that category nutrient will be displayed with a picture on the left side of the screen, while you can see the list of various nutrients covered under that category on the right side. This list will be displayed as beautiful picture tiles with names of nutrients and a little description. Click on any tile to open and read the full description. You can navigate between various nutrients and read their description and sources by using the left and right headed arrows. The back arrow button on top left of the screen will take you back to the main screen. Also try Nutrition Manager, EatSmart, and Recipes by allthecooks.com. Foods Rich In is a nice app that contains useful information about various nutrients and their sources. Do try the app to know how various nutrients are essential for our body and which foods contain them. Share your feedback via comments. Get Foods Rich In here!